Dubai: The UAE has risen six places — up from 25th last year — to rank 19 out of 134 countries in the Global Knowledge Index 2018, as revealed on Wednesday at the Knowledge Summit 2018 in Dubai. The UAE again placed second in the ‘Economy’ category, which is one of seven ‘Sectoral Indices’ that together determine the overall rank of a country in the report. Singapore was ranked top in Economy this year. Overall, Switzerland was placed number one in the world in the 2018 report, followed by Finland and Sweden. The fifth edition of the two-day summit is organised by the Mohammad Bin Rashid Al Maktoum Knowledge Foundation (MBRF). The report is produced annually by MBRF in partnership with United Nations Development Programme (UNDP). Attending the opening ceremony were Shaikh Hamdan Bin Mohammad Bin Rashid Al Maktoum, Crown Prince of Dubai and Chairman of Dubai Executive Council; Shaikh Ahmad Bin Mohammad Bin Rashid Al Maktoum, Chairman of MBRF; Jamal Bin Huwaireb, CEO of MBRF; and other senior officials. Speaking on the sidelines of the summit, Bin Huwaireb said the UAE’s performance was exceptional, and the country aims to eventually rank number one in the index. The UAE’s strategy, he added, is focused on developing education and innovation. One of the reasons why the UAE jumped six places this year was that a number of international organisations had updated their data on the UAE, which was reflected in the results of the index, Bin Huwaireb said. Speaking on the sidelines of the summit, Hany Torky, Arab Knowledge Project Director at UNDP, said it was “very difficult” for any country to jump one or two places in the index, let alone six places like the UAE. However, its strong performances in the seven Sectoral Indices — especially in Technical and Vocational Education and Training and ICT — boosted its overall standing, Torky added. In the coming years, the UAE’s long-term strategy and investments in developing a knowledge economy will hinge heavily on the youth, which is “a positive power” for society, Torky said. With regards to the UAE’s aim to rank number one in the index, Torky said the UAE’s priority of developing technology in Artificial Intelligence (AI), cyber security, biotech, and blockchain, will play a major role in meeting that goal. “I think the UAE has this vision and they are building new technology and new rules, and linking technology and the labour market, and also linking the economy and the labour market,” Torky added. On UAE’s second place rank in ‘Economy’ category, Torky said it was because the UAE has “an open and competitive economy, with no barriers to entry for foreign investment”. However, the UAE fared poorly in ‘Environment’ under the ‘General Enabling Environment’, ranking 131 in the category. Its carbon dioxide emissions relative to population were high, while its share of renewable energy consumption, out of the total consumption, was low. “For all oil countries, the Environment rank is very low,” Torky said, adding that the UAE has the potential to lead in the Environment category among oil-rich countries. Wednesday’s summit also launched the first-ever ‘The Future of Knowledge: A Foresight Report’, which looks at the impact of disruptive technology such as AI, cyber security, blockchain, and biotech, among others. The report was also produced by the MBRF and UNDP. Torky said one of its key findings was that UAE is placed among six countries — including the US, UK, Brazil, Finland, and Singapore — that will lead the world is these new fields. For the UAE, its special strength will be in Blockchain and AI. On Wednesday, Shaikh Hamdan and Shaikh Ahmad honoured winners of the Mohammad Bin Rashid Al Maktoum Knowledge Award and 2030 Literacy Challenge at the summit. 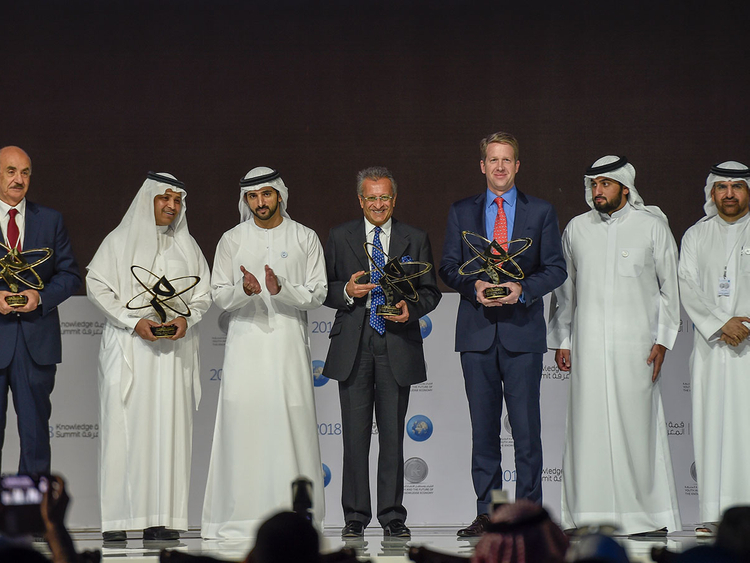 The first winner to receive the knowledge award was Magdi Yacoub Heart Foundation, from Egypt, followed by Institute of International Education (US), The Saudi Digital Library (Saudi Arabia), and The Amersi Foundation (founded by UK businessman Mohammad Amersi). For the Literacy Challenge awards, the winner in the government category was the Ministry of Education, Egypt; the NGO winner was Unesco; and the individual winner was Dr Shifa Hassan from Sudan.